This article was originally published on the Evergreen Outdoor Center blog on October 25, 2005. JAN has been working hard since it’s creation in 2000, by Mr. Azusa Degawa, towards avalanche safety and awareness in Japan. 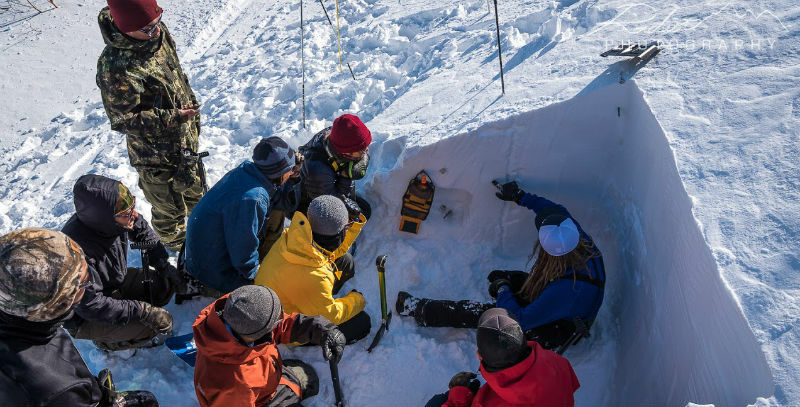 First with the translation of Bruce Jamiesons text, ‘Free Riding in Avalanche Terrain’ and other awareness publications into Japanese, support of Recreational Awareness Courses (RAC) and now the CAA Level 1 course in Hakuba, Nagano. This course was a great success and will hopefully become an annual event here in Japan. The Ski Operations Level 1 Avalanche Course has been running in Canada now for almost three decades and has become the official standard in Canada and a standard setter for avalanche course structure around the world. The Canadian standards have been used to establish the New Zealand Avalanche Association and now JAN has set up it’s Non Profit Organization also based on the CAA regulations. So what made this avalanche course so special? Well, it was first, a gathering of winter mountain professionals from all over Japan to learn about avalanche safety and stability forecasting skills; second, it was a start to having a set of internationally recognized avalanche safety standards and snow pack recording procedures in Japan; and third a chance for the Japanese industry to meet and learn from three very experienced and talented Instructors from Canada, not to mention the wealth of experience put into creating this course by the many others who have dedicated a great portion of there professional careers into research and development of this avalanche course. My involvement in the course started with guiding the three instructors from Canada, Randy Stevens, Nic Seaton and John Buffery around the areas that the course would take place. The first day that we went out into the backcountry we had about a meter of powder on a previous sun crust and were cautious of the avalanche danger, loud whumping sounds from the collapse of the deep week layer made us even more wary. We crossed slopes using adequate spacing and followed the safest routes through the trees for ascending to our goal of the upper ridge. We prepared for the promise of great snow on the decent. Skiing one at a time and stopping in safe places we made some fantastic turns. Turns that I overheard one of the instructors saying were the best he could remember. It truly was one of those awesome days in the Japan Alps and a great start to the week long course. The first two days were spent in the seminar room with lectures given by the three instructors and translated by Yukinori Saotome, Yasuhiro Arimoto and myself. Content consisted of avalanche mechanics & dynamics, avalanche terrain assessment, introducing students to the CAA field book & the stability evaluation check list, case studies, class discussions, videos, slides and a fascinating presentation on Japanese weather patterns by Mr. Michihiko Tonouchi, Manager and Forecaster for the Japan Weather Association. The afternoons were spent doing demonstration snow profiles, weather taking procedures, beacon practice and self-rescue procedures. By day three the students and the instructors were longing to get out of the stuffy classroom and into the mountains. So after the daily weather forecast it was on to the shuttle to Tsugaike Kogen Resort to ride the Gondola to the top. Skins and snow shoes were put on and beacons checked before the climb into the backcountry. Because of weather and avalanche concerns the three groups of 6 students, instructor and translator did not get too far from the ski field, yet accomplished all of the planned exercises; group management, terrain assessment, student snow profiles and stability tests, Reuch block test and field weather taking. Once back and to the bottom safely it was back on the shuttle and back to the Sierra Resort Hakuba, where the in class sessions were done, for weather observations at the weather plot that was created only days earlier out of the ingenuity of the instructors. The day finished by plotting the days snow profile results and completing a snow stability evaluation checklist. This is just that, a checklist to assess the present stability of the mountain snow pack in the immediate area from observations made that day in the field. This checklist also helps assist in a forecast of stability for the next day when combined with the weather forecast. Classes were finished at 7:00pm with everyone ready for dinner, bath and a good nights sleep. Days 4 and 5 were spent much as day three with the three groups traveling separately into different local terrain yet working more on route finding and group management skills as well as making slope stability evaluations by using the procedures learned in the first three days. Day 5 allowed each group to travel further afield as the weather improved and the snow pack stabilized. All groups got some long awaited and well deserved powder turns at the end of this day making the last field day a great success.